Interesting reading through all this, somehow I missed this thread before. What made me pull it up is watching a documentary/interview about Robert Mitchum, they bring up Till The End of Time (1946) which is the movie that I most closely associate with TBYOOL. It's not a great picture, as TBYOOL is, but it is a really fine one with an interesting take on the woman left behind/widowed by the war in Dorothy MacGuire. MacGuire's character is neither Virginia Mayo's selfish party girl, nor is she the picture perfect soldier's widow. She's quite flawed, and her judgement not always the best. She hurts herself a great deal. This makes it a fascinatingly mature and well rounded character, with MacGuire's performance fully equal to its demands. She delivers a sophisticated performance that is just messy enough to be heartbreakingly real and not always entirely likable. Providing further interest is an outstanding supporting appearance by Robert Mitchum. I say "outstanding" because I think Dmytryck was brilliant to cast him in such a movie, playing such a character among all these apparently "ideal" American suburbanites. An actor who fit seamlessly in the seamy world of noir, here in Pleasantville ( ) he jumps off the screen, provideing a brash slug of dangerous instability and one of his classic examples of that "cool" customer that became legendary. His "William Tabeshaw" almost seems like a dry run for the rootless cowboy character in Nicholas Ray's The Lusty Men. If you like TBOOL, give this movie a try. It's not as perfectly fine a film, but it's just as adult. Sadly, it's not on DVD and not currently scheduled on TCM, but if it pops up on the dial I'll post a reminder here. MissG, I agree with every word of your review. Till the End of Time is a fine film. Guy Madison is limited as an actor, but everything he's called on to do is well within his range. He's amazingly good-looking, but isn't stuck on himself the way Robert Redford always was. The pairing of Madison and Dorothy McGuire is strange, but it works, which is really what the film is about. She's older, smarter, and even more damaged than he is, even though he's been to war. 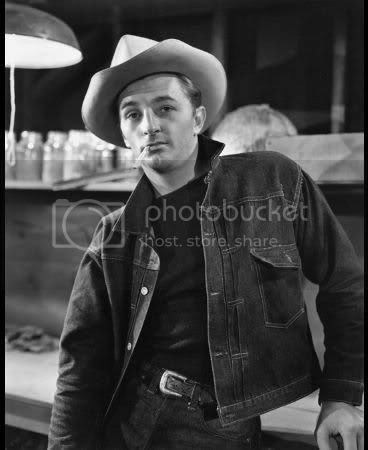 As you said, Mitchum is perfectly cast, like a younger version of his character in The Lusty Men. TCM has shown this film in the last two years, but it's time for an encore. Dmytryk's direction is excellent, and, as a side note, he married the actress who plays the girl next door. I didn't know Jean married the director, they would make a cute couple. reminded me a little of his own real-life marriage to Gail Russell. I can already foresee Cliff's mother giving the "happy couple" some rough moments in the future. I made the mistake of watching the last 45 minutes or so this morning. Cried through the whole thing. Homer showing Wilma about his routine. Dana Andrews and his struggles. How frustrating it must be to be so good at what he did and come home and, to him, mean nothing from here on out. His hope though it wavers is renewed at the end. Another great moment I found was when Andrews' father reads his citation for the Distinguished Flying Cross and the end just puts the paper down and takes off his glasses. It is the most subtle look of pride I can recall. What things that generation had to endure in the war and after is hard for me to imagine. There were some amazing people. I'm on the verge of tears too, Chris! That scene with Roman Bohnen as Dana's dad...well... I'm too choked up to say how good it is. These were the kinds of people who didn't talk about their problems, the ones coming back from war, it was not something to dwell on. Even though their actions were heroic, that heroism came out of conflict and violence that they probably didn't want to remember. And yet, they got some sense of respect there, a feeling of pride in what they did. It was all mixed up together, so in order to subvert the bad experiences, one had to subvert the pride too. Or at least that's what I get from Dana's character. And that's just scratching the very surface. The scary part was coming back, not facing the enemy but facing your family... or a life that had changed so much around you that you no longer fit it. Things must have seemed weirdly out of tune alongside the horrors and the comraderies of war. facing your family... or a life that had changed so much around you that you no longer fit it. Things must have seemed weirdly out of tune alongside the horrors and the comraderies of war. My (ex) husband served in Vietnam in 1967-68. During that time, Laugh In became a national phenomenon. When he came back home, I remember him sitting in front of the TV, totally bewildered, while the rest of the family was roaring with laughter. As I recall, he learned to 'like' it, but was never an enthusiast. My gosh, Nan, that's really interesting... it must have been too much for him to deal with. How crazy we must seem to someone who's been to the brink and back. This would be a phenomenal double bill alongside COMING HOME. Same issues. Different reactions. I never thought about it on a double bill, red. And I don't think I've seen Coming Home since it was out in the theatre.
. . . . . "facing your family... or a life that had changed so much around you that you no longer fit it. Things must have seemed weirdly out of tune alongside the horrors and the comraderies of war"
I've always had a great love and respect for returning military men and women and still do, and fortunately although the guys coming home from WWII and Korea came home to parades and honors as befitted them, so returning to normal everyday life was probably very difficult, but at least they fought for a real and true reason. Also, their families were pretty much cared for, not in total, but they did receive benefits for housing, and food for their families. The guys returning from 'Nam were treated like they caused the war themselves and in most cases had to wait years for any sort of compensation or respect. On the other hand, our boys from Iraq, within a few months knew they had no business being where they were since it was a complete sham and many of them are returning home to find their families in desparate need of help. But through all of it, the brothers in arms feeling seems to continue. Women make friends but still continue to vie for fashion sense or mothering skills, but men become brothers with very little if none, attention to color or creed. I asked long ago where were our home front donations to the 'war effort'? Our mothers and grandmothers gave up nylons, and meat, learning how to cook Spam in a hundred different ways. With Iraq, we were given money to spend more with never a mention of thinking of the boys. I thank the lord for movies like those from last night on TCM to remind us of how it was at one time, when everybody stood together and just cared about life in the U.S.A.
We were so disenchanted with the activities in Viet Nam, we were less than respectful of those who served. We were in error. I knew a guy who was reluctant to wear his uniform in public. He wanted to say, "It's not my fault!" I asked long ago where were our home front donations to the 'war effort'? Pardon me while I fall down laughing! I hate to think what would happen if we were asked to give up cell phone minutes today! Is the word sacrifice still in the dictionary? "THE BEST YEARS 0F 0UR LIVES" great movie...touching. Heartbreaking. "SINCE YOU WENT AWAY" doesn't move me nearly as much. No Red, I don't think that word is in the dictionary any longer. 'Nam was my war. All the guys I dated went into the army or marines straight out of H.S., or as soon as they could thereafter. When they came home, I was married but still in touch through my girlfriends whose brothers were there. In our tight little corner of the world, and being busy with babies, I had no time to watch the news, so when Tom Cruises' movie, Born on the Fourth of July came out, I was shocked at the way he was treated. To this day, I still don't understand the thinking. As your friend said, HE didn't start it, so why did people treat returning G.I. 's like that? They must have felt like crap if they saw any old newsreels about the returning ships of G.I. 's after WWII, and especially that one where the sailor kissed that girl. Makes me feel very sad.